Nicole’s idea: What I did to make my Brownie meetings girl led is had my girls be the “leader for the day”. They got to pick which patch they wanted to work on, and everyone got to present at least one activity to all the other girls in the troop. That way, if more than one girl wanted to do the same badge, they could each present on one requirement for that badge. Then I let the other girls decide if they wanted to complete the badges at home or not. They were all required to check in with me and answer questions about what they finished before I gave them their badge at the end of the year. Elizabeth: We don’t group the badges with the journey (even though they are marketed that way). We let the girls nominate any badge (legacy, fun, journey, etc) they are interested in and then have a group vote. 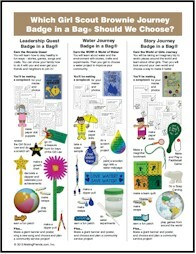 We have used the Badge in a Bag® from MakingFriends® .com on some of the badges and journeys. We can typically get a badge done in 2 troop meetings. A journey in 6 meetings. Jane agrees: I have my girls vote on what badge or journey they might want to earn next then just go to MakingFriends® .com to get their Badge in a Bag® kits! It’s everything you need to earn the badge or complete the journey. Kelly’s input: Our Council has a chart showing that Daisy and Brownies are leader led, Juniors and Cadettes are a mix and then the Seniors and Ambassadors are girl led. I am not sure Brownie aged girls are mature enough to lead themselves. Just my observation. I have Cadettes and Seniors and I still have to work with them to do what they want/need to do. Lisa write’s in her councils guidelines: Daisy is 90 percent leader 10 percent girl, Brownie is 80 leader 20 girl, junior 65 leader, Cadette 40 leader, senior 20 leader and Ambas 10 percent leader. Terri’s experience: We have mostly done journeys in a weekend sleepover, or over the summer in a day camp or twilight camp schedule. We also invite other troops to participate. This means our girls interact with other troops and we (the leaders) get help (from the other troop leaders) in planning and implementing the activities.